The Arnold Press is a great multi-joint exercise for your shoulders, triceps and upper back. It is my favorite shoulder exercise! It can be done with dumbbells, kettlebells, exercise bands or even a can of beans in each hand! Arnold Presses can be a great addition to a full body circuit routine. 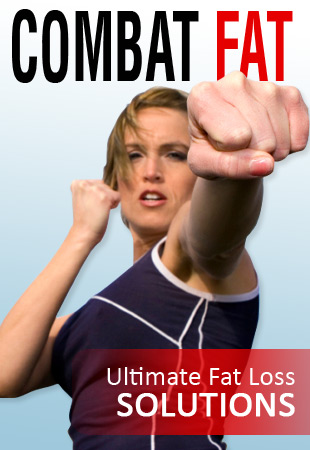 They can help you lose weight and tone and build muscle in your arms and shoulders. Got flabby arms? This is a great exercise to tighten and firm those triceps! Stand with your knees slightly bent, weights in your hands with your elbows flexed and your palms facing your shoulders. Press (or lift) the weight overhead. As your hands are going up, rotate your arms out in a corkscrew fashion. Right above your head, your palms should be facing each other. At the full extension of your arms, your hands should be facing forward. As you lower the weight, just reverse it. A lot of exercises that can be done while standing can be done while seated. Some people like to do them seated because they can concentrate and feel their muscles more intensely. It can also be beneficial if you have lower back issues to be seated. Personally, I feel like if you can do it standing up, then you are better off! If you are standing up, you will be using more muscles and burning more calories…your body will be working as a whole, from the ground up! Why it is a great exercise…. More of your shoulder muscles are being used here than in a normal dumbbell overhead press: At the beginning part of the move, the front part of your shoulders (anterior head) are doing most of the work. As you rotate your arms outward, the outside of your shoulders (the medial head) pull on your arms. As for the triceps, because your elbows are fully flexed and then you extend your arms all the way, your triceps are working through a fuller range of motion than other shoulder and triceps exercises! Bottom line? More muscle action equals a better workout in less time and more calories used to help you lose weight! I’ve noticed that some people tend to lock their knees and lean back when doing the Arnold press and other overhead exercises – don’t do this! Concentrate on keeping a slight bend in your knees and standing straight up. Something that I have found to be helpful is to put one foot in front of the other instead of parallel with your shoulders. This makes me feel a lot more stable, especially if I’m lifting heavier weights. is a great way to cause your core to “lock up” differently because your body is off balance. I like to do them with one arm, then quickly switch arms and then switch back again, completing multiple sets without putting the weight down. This creates a great “burn” and I feel like I can hurry up and get it over with! Lift one, lower it, then lift and lower the other one. I prefer to keep them both moving like opposite ends of a see-saw...one is going up while the other is coming down. I feel my core and abs tightening more doing it this way! The Arnold press is a great exercise to include in your weight loss routine. For example, using it in a circuit with back rows and squats will hit most of the muscles in your body and get your heart rate up! It also works the traps in the upper back which can help strengthen your neck, improve your posture and perhaps even reduce stress! Return from "The Arnold Press" to "Shoulder Exercises". Return from "The Arnold Press" to EGTLW Home.